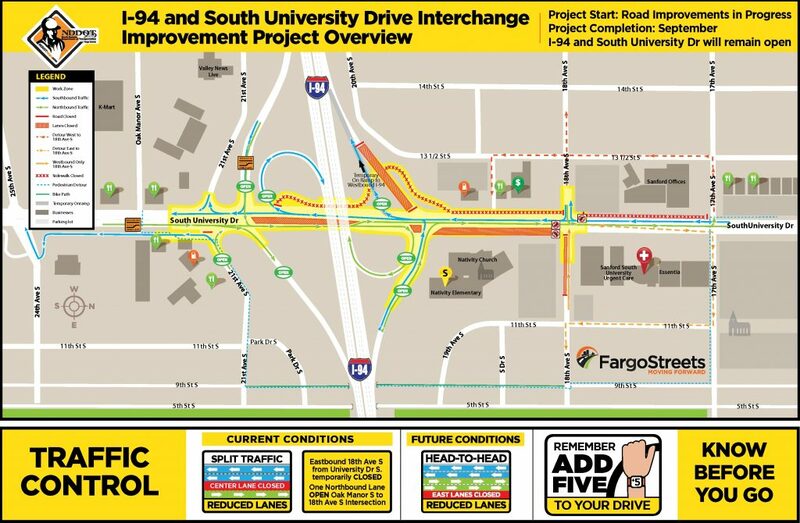 Beginning Monday, July 16, in the afternoon contractors for the North Dakota Department of Transportation (NDDOT) Fargo District and City of Fargo Interstate 94 (I-94) and South University Drive interchange reconstruction project will shift traffic control to allow for enough room for median removals and machine pave to occur in the center of South University Drive north of I-94 bridge. The northbound lane reduction will also allow crews to remove a portion of the inside driving lane to pave the new northbound driving lanes north of the westbound offramp. Work is slated to be complete by the beginning of the next week, week of July 23. The closed northbound driving lane will reopen to allow for two lanes of traffic in each direction and until traffic is diverted onto the new concrete roadway in the next phase. South University Drive southbound traffic will not shift and continue to have two driving lanes open. 18 TH AVENUE S AND SOUTH UNIVERSITY DRIVE TRAFFIC SIGNAL – The detoured single lane of eastbound traffic is slated to reopen by end of next week, Friday July 20, weather permitting. The reconstruction project work on the east side of South University will continue for the next two – three weeks to complete removals, underground and paving operations. Traffic will then shift to be carried on the east side of South University Drive on the new concrete roadway. Crews will begin reconstructing the west side of the roadway. Once complete, traffic will then shift to the outside of each side of South University Drive in their respective direction of travel to allow crews to work in the center of the roadway.